I’ve been fortunate to have worked as an orchestrator in 4 major centres of orchestral recording – the 5th will be Sofia (Bulgaria) later this year. These scores have been for Richard Mitchell (movies) Ian Livingstone (video games) and Tim Duncan/Ed Barnwell (ice ballet theatre production). Manchester (my town) is also home to fine orchestras, though not accustomed to score sessions like London, Warsaw, Prague and Moscow. Undoubtedly the London sessions still feel like ‘home’ where the results were outstanding but we got excellent results from all locations. ‘Results’ mean 3 things’ fine performances from the musicians, industry-standard audio recording, efficient time management. In my experience, each centre had its own particular strengths. Talk to writers and producers about recording abroad and you’ll hear horror stories of sessions falling apart. The blame seems to fall on the studio, or the conductor or the musicians. But I wonder whether some of the problems were ‘user-error’. You get out what you put in, I believe; this is not about any qualities of the music, rather the orchestrator’s session management – score preparation, click/guides and communication with studio team. I write about the power of notation as an effective communication tool in another post, but as long as my notation is accurate and provides clear direction for the musicians and engineer, they will make it work (and thank you for allowing them to do their job!) 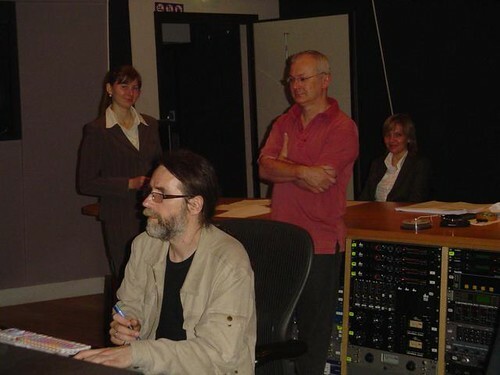 You also have to respect their working practices; the engineer knows his studio, the conductor knows his musicians; as long as the score is adequately marked with direction, articulations, phrasings and dynamics, they will interpret it for you. And, wonderfully, all cultural and language barriers disintegrate as music becomes the language. I’ve always felt honoured to take part in these sessions. By the time the conductor kicks off the first cue, my work is largely done, except for clarifying aspects of performance and feel, and facilitating any updates the composer requires. And best of all, you get to visit these great cities, meet some great music industry professionals and lap up the culture (aka drink local beer). Read more about score preparation here. Orchestral sessions in the city – it still feels like being let out to play!. On the face of it, the task doesn’t look like fun; hours of relentless score preparation, the mad rush of the final week to respond to updates and last minute compositions, and the crazy flight times that get you to and from the job. But in spite of all this, it’s still a buzz. All the graft is justified when you sit in the control room listening to the musicians bring to life those dots and lines on the paper, and finally put flesh and blood into melodies that have only existed with samples for so long. I guess the pressure to complete this great body of work is a stimulant; the challenge is motivating. The end result is enormously satisfying, validating the need for craft and detail in score preparation. The orchestrations were for an ice dance production (Cinderella, performed by the Imperial Ice Stars) with a score by Tim Duncan and Ed Barnwell. 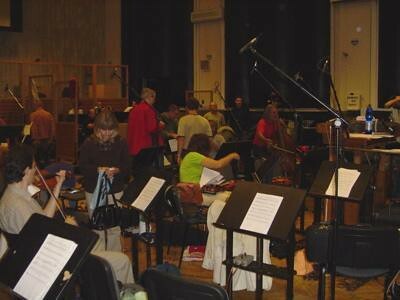 The orchestra was the Moscow Film Orchestra, recorded at Mosfilms. These sessions were for strings; wind, brass and percussion will be added in the UK. We arrived in Moscow on the same day 40,000 footie fans descended on the city for the Champions’ League final (Manchester United v Chelsea). What are the odds on that? Yet, incredibly, the journey was hassle free – no flight delays and just 10 minutes to get through passport control. Different story coming home – grim! I’m continually impressed by the professionalism of musicians and studios around the world. The standard in Moscow was high SSL desk, ProTools on a Mac, ATC monitors, Neumann and Russian mics in a facility similar to Studio 2 at Abbey Road. 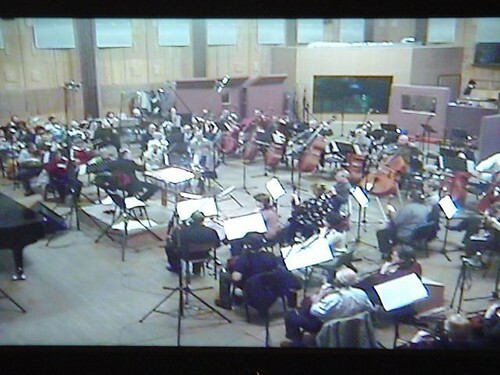 The studio was at Mosfilms, with the Moscow Cinema Orchestra. I was especially impressed by conductor Sergei Skripka, interpreting the music exactly as required, with little need to discuss with me or the composer. Proof that if the score is thoroughly prepared, with clear direction, it will be efficiently performed. We’d attempted to record over an hour of music in 2 days – too ambitious, so we’ll be returning later in the year. A realistic aim for even moderately complex scores might be 20 – 30 minutes completed per day. I asked composer Tim Duncan if he was pleased with the results. Cinderella on Ice starts a global tour in 2008. I love the social web and one of the really cool things is that I keep coming across my work, splattered around. I was lucky enough to be asked to put some string arrangements on Jade Gallagher’s album, then to prepare some arrangement scores for live gigs (including a couple with the BBC Concert Orchestra). Here’s Jade at her album launch (or soundcheck at least) performing The Way You Are Tonight, with a string quartet arrangement of mine. Don’t look for me in the quartet of players!